World Class Florida Fishing Charters and Tarpon Fishing Charter in Boca Grande and Tampa Bay require top quality specialized boats and tackle. Capt. Jeff depends on his equipment for his livelihood. He chooses his equipment based on its quality, functionality, performance, and dependability. It must stand up to the rigors of constant use by his customers and tournament fishing. By using the best equipment, matched to the fishing situation his customers have the most enjoyable experience and he has a competitive tournament advantage. 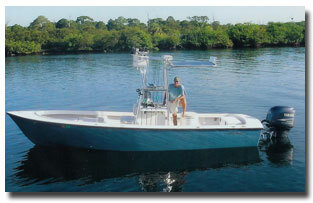 For the inshore type of charter fishing I do in Florida, my Sheaffer Boat is the ideal fishing platform. When choosing a boat my primary considerations are safety, fishability, and reliability. My boat must be designed and laid out in a functional, stable, and efficient manner so that my customer will have a safe and enjoyable experience. My Sheaffer Boat gives me the capability to fish the shallow flats and back country of Florida with plenty of open casting and seating room for my customers. It allows me to run across rough open bays in comfort with a softer, drier, and better tracking ride to take advantage of the best fishing tides and locations. I can go where the fish are, whether its crossing Tampa Bay our running to a wreck at Boca Grande, with the full confidence that my customers will enjoy a stable, dry ride. Many of the features of a good fishing boat go unnoticed, and thats how it should be. Everything is in the right place, well thought out, and designed for its function. This is especially important in the charter business where not all your customers are experienced boaters. When you fish as much as I do, you appreciate the reliability of your boat. With Sheaffer, reliability is built in, because with Sheaffer Boats there are no short cuts. Sheaffer Boats uses only the highest quality components and assembles the boat with meticulous attention to detail. When I finish a day on the water, it is good to know that I will not have to be working on my boat tonight and that it will be ready to go fishing again tomorrow. You cannot go fishing if your motor is in the shop. My livelihood depends on my engines and my Yamaha four stoke outboards are the most reliable engines I have ever owned. You get in the boat and turn the key and go fishing. The days of worrying are past, its like getting into your car and starting it up. You do not wonder whether it will start, you just start it and go. The first thing you notice is how quiet the engine runs. You have to check the tack for an indication that the engine is idling. The response to the throttle is smooth and the power puts you on plane quickly and quietly. Even while running underway my customers always remark how quiet the engine runs. This is a great advantage because it puts my customers at ease and makes the trip more enjoyable when you can talk and exchange fish stories comfortably. Many of my tarpon fishing charters at Boca Grande Pass requires that my engine runs in idle all day while I shift in and out of gear to adjust my drift. My Yamaha handles this without a problem and delivers quiet, non-smoking, easy shifting performance. I can concentrate on the tarpon fishing and not on my motor. The engines charging system easily keep my batteries charged and my electronics and bait wells running. At the end of the day on the run in, it is time to reminisce about the events of the day in the quiet confidence that my Yamaha will bring us home. These below decks heroes make everything else happen. I love equipment that makes my life simpler and requires less maintenance and Odessey batteries do just that. 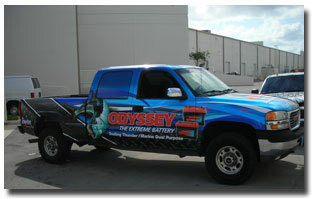 Odessey batteries are very different from standard liquid acid batteries that are openly vented. Odessey batteries operate as a sealed battery, recycling all gasses internally. That means no corrosion of the positive terminals or corrosion to the surrounding equipment. Because the batteries are completely sealed there is no fear of any acid spill or need to add water. The absorbed glass mat technology of the Odessey Batteries offer the characteristics of two separate batteries in one package. They can deep cycle 400charge/recharge cycles as well as provide enormous engine cranking power. A typical starting battery cannot do both. There is no limitation on the inrush current, so you are assured of fast recharge recovery. Paired with my 36 volt MotorGuide Great White trolling motor these batteries provide all the power I need for several hard days of fishing. The batteries have an eight to twelve year service life which saves you time and money because you do not have to replace the batteries as often. Unlike conventional batteries that need to be recharged every 6 to 12 weeks the Odessey battery, when fully charged, can be stored up to 2 years. Then simply recharge and the Odessey battery is returned to full power. Try that with a conventional battery! My ability to precisely target fish and structure has been the key to my fishing success. My Raymarine C-Series and E-Series digital fishfinders, GPS, and charterplotter have enabled me to precisely navigate to and locate structure and fish. The Multifunction Display provides easy to use, high definition performance. Shallow water, high speed and choppy seas are no problem. Being right on the tarpon in Boca Grande Pass is critical to fishing success. The clear high definition digital presentation of my Raymarine electronics allows me to eliminate false clutter and more precisely identify tarpon and bottom structure. 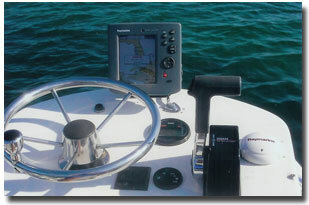 The more time you are in fish the more fish you will catch and Raymarine puts you there. I fish many wrecks and reefs and my Raymarine GPS and chartplotter take me right to my destination, saving time and gas. The multifunction display allows me to see my position on the chartplotter, GPS coordinates and bottom structure all on one screen. I have been amazed by the precision of the chartplotter information. It is so good that I have even used it to navigate shallow water flats at night to target snook. I have literally followed the contour lines on the charteplotter across flats that were only covered with inches of water. Raymarine electronics have no equal. I could not be as successful as I am without them. From finding tarpon in the deep passes of Boca Grande and Tampa Bay, to navigating to wrecks or through storms and fog, my Raymarine machines do it all. If you want more you can even expand the same units to interface with radar, autopilot, Satellite radio, engine performance and on-board cameras. Staking out has a whole new meaning since the introduction of the Power Pole anchoring and positioning system. In the shallow flats and backcountry fishing I do in Florida, I need to move around and anchor my boat many times during a day's fishing. My trolling motor quietly gets me within range of the tarpon, snook or redfish that I am after, and my Power Pole quietly holds me in position. No more noise from moving around the boat to get the anchor out and over board. No more taking your eyes off your quarry. You just hit the button and you quietly stop in place. And if some fish pop up unexpectedly while you are moving across a flat, you can quickly stop the boat and take advantage of the opportunity. If I need to move or reposition the boat it is also a very quiet and clean operation and since I do not have to retrieve an anchor I do not bring any mud or grass aboard. The fish are happily undisturbed, I am happy and my customers are happy. I use the Power Pole XL which allows you to anchor in up to 8 feet of water. The remote control allows me to lower and raise the Power Pole from anywhere in the boat. The high quality finish on the aluminum and stainless components make the Power Pole suitable for saltwater fishing. An added benefit to using the Power Pole is that it is does nor tear up the fragile grass flats that I fish. So much of my fishing is site fishing and my ability to see the fish has been greatly enhanced by the use of my Maui Jim® Polarized Plus2 sunglasses. These lenses completely eliminate glare and the lens quality provides unsurpassed clarity. Not all polarized glasses are created equal. Day in and day out I have customers on a fishing charter who are wearing polarized sunglasses who cannot see the fish I point out to them. It is true that a trained eye helps a lot, but so do your glasses. I have often looked through my customers glasses only to discover that there are great differences in glare reduction and clarity between polarized sunglasses. Being out in the sun on the water every day is hard on your eyes and it is great to know that my eyes are protected from 100% of uv rays. My Maui Jim® sunglasses are one of the most important items in my tackle box. They will not bite if you cannot fool them and Bass Assassin Baits catch fish. The people at Bass Assassin are fishermen and they listen to the pros for bait design and colors. Their line of Saltwater Assassin baits and Blurp baits with fish attracting scent turn fish on. Paired with the Boodah Shaker Jighead and you have an unbeatable combination. This jighead comes in a wide variety of colors and has a sharp, wide gap hook for positive hook set. I am a believer in eyes on a bait and the eyes on the Bassassin jigheads are outstanding. This jighead paired with a 5” Jerk Shad in the Drunk Monkey and New Penny colors is deadly combination for snook, trout, and redfish. The great variety of fishing available on a Florida fishing charter requires a many different sizes and styles of hooks. The hook must be matched to the fishing situation and Mustad has perfected the art of hook design. Mustad's Ultra Point hooks have a chemically sharpened hook point which penetrates easily will not bend or turn in when set. An example of one of Mustads specialty hooks is the 91768UB. I use this hook extensively in the 5/0 size with a Bass Assassin 5'' jerkshad to fish for snook, trout, and redfish on the grass flat of Tampa Bay, Tarpon Springs, and Clearwater. The hook is an adjustably weighted jerkbait hook designed for weedless presentations. The patented sliding weight on this hook can be moved to change presentations. Sliding the weight back allows the bait to sink away from you under docks or mangroves. Moving it to the center allows the bait to settle levelly to the bottom, while moving it forward makes the bait dive for the bottom. It is often the little things that make your life on the water more enjoyable and more efficient. 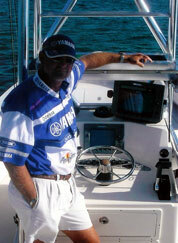 Deep Blue Marine Products makes a line of fishing and boating accessories that do just that. As a charter fishing guide I spend a lot of time rigging tackle for my customers so having my rigging tools and leader material handy is very important. Deep Blues Leader Dispenser and tool holders are mounted on my console where I use them most, but since they are mounted via suction cups I can move them around the boat as needs arise. The same is true for my fish landing tools such as nets, gaffs, and Boga Grip. Deep Blues trolling motor mounting system allows me to easily remove my trolling motor by merely pulling two pins. Sometimes it seems you can never have too many drink holders on you boat but you do not want to drill holes all over your boat to mount them. Well, Deep Blue has several options which attach by suction cups and can be moved around as needed. The guys at Deep Blue are fishermen and they build high quality products that make your life on the water more enjoyable.